Like Microsoft and IBM, Apple faced the same set of growing pain issues as technology moved into the 90s. However, Apple’s complete ownership of the Mac platform allowed it more freedom to pioneer new technologies, and expect users and developers to adopt its new conventions more rapidly. Throughout the second half of the 80's, Apple had shipped five new major versions of the Mac System Software; by 1990, the company was at System 6. After an initial flurry of rapid development, the Mac platform hit a wall. 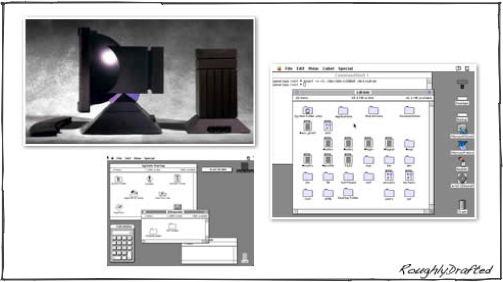 As the Mac morphed from a simple appliance computer into a new role in a more complex, networked world, it began to rise into competition with the low end of Unix workstations built by vendors such as Sun, SGI, and Apollo. That pressed Apple to deliver new software that could compare with Unix, but the Mac's software architecture made that difficult to deliver. The original Mac was engineered to be a decisive jump from the typical home computers of the 1980-1985 generation. However, as it grew into competition with workstations, the advantages of other vendors' Unix heritage became clear. The Mac was a designed to be a friendly home computer appliance, while other workstations represented a refined implementation of much larger, multiuser, multitasking computer systems. 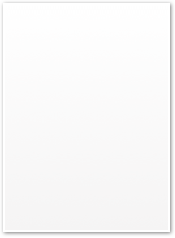 For example, the Mac's graphics drawing routines were all handled in shared memory. This made sense on the early Macs with sharply limited resources, but as the platform expanded and users' expectations advanced, this posed a problem for running multiple applications at once. There was no simple way to retrofit preemptive multitasking or protected memory into a system where every application's graphics were being communally handled by a cooperative of applications. 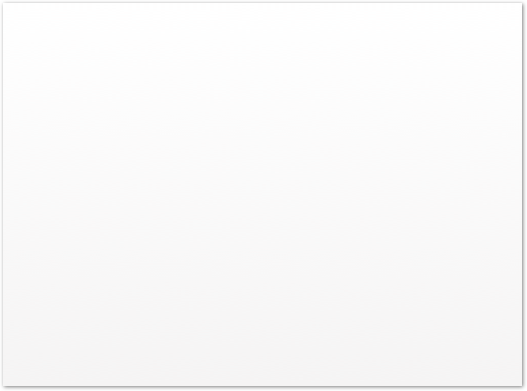 Other parts of the Mac ToolBox of built-in routines were also showing their age. 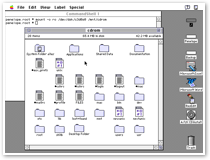 Since the engineers of the original Mac had to shoehorn lots of novel functionality into hardware barely up to the task of supporting a fully graphical desktop environment, they had to write their code to talk directly to the underlying hardware. While this tight code ran impressively on the affordable hardware of the time, this restricted portability of the code later, as described in Why Macs Haven't Used Intel Processors Before. Apple faced a quandary: was it time to replace the Mac with an entirely new platform, as it had earlier when moving from the 70's Apple II to the 80's Mac, or could it manage to retrofit the Mac platform to run on new and advanced hardware and also incorporate the operating system features that were common on Unix workstations of the time? Apple hedged its bets by working on multiple strategies. In 1988, the year when IBM and Microsoft announced their OS/2 partnership, Apple delivered its own version of Unix, called A/UX. Apple continued to refine the product as an alternative operating system for higher end Macs, and delivered a compatibility layer to run the Mac system and other software on top of A/UX in a process. This laid the foundation for retrofitting Unix, or at least some Unix-like functionality, underneath the Mac System. Apple also worked to deliver two new generations of the existing Mac system software: a "Blue" list of short term features, which was delivered as System 7 in 1991, and longer term concepts that were planned to be delivered under the code name Pink. The company also began talking about an entirely new platform code named "Jaguar," based on the 88100 RISC processor from Motorola, and depicted in the Mac press using lines suspiciously similar to NeXT’s. 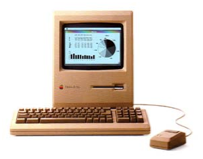 However, Apple's significant efforts to migrate its user base from the Apple II to the Mac, and the previous disappointment with the failed Apple III, Apple IIGS, and Lisa (a cousin platform to the Mac), clearly outlined that introducing a Mac replacement platform would be a huge challenge. It would actually be relatively simple to design and build a completely new Jaguar Super Mac from scratch. It could easily improve upon the now half decade old Mac and avoid many of its mistakes. The latest generation of hardware could easily bypass many of the compromises made to deliver the first Mac in 1984. The real difficulty would be finding a market for the new machine. If it lacked backwards compatibility, Apple would have to convince developers to port all their applications before anyone would buy it. But if nobody had it, why build applications for it? Conversely, if it provided flawless backward compatibility with the Mac, then its new features might never be really put to use by developers. These same problems were faced by Microsoft and IBM in trying to establish OS/2 as a new platform: how different from DOS could it afford to be? While OS/2 was beginning to offer a much stronger foundation than the aging MS-DOS, developers weren't quick to jump on OS/2 development because it wasn't yet widely deployed. Apple wasn't the only company working to replace the stagnating Mac; it had competition, and much of it came from employees who had left Apple to build a better Mac on their own. The first was Steve Job's NeXT, which had been in development throughout the late 80s. Be Inc. arrived in 1990, founded by former Apple executive Jean-Louis Gassée. John Sculley had directly appointed Gassée as Job's successor, and now both Jobs and Gassée were heading rival companies. How did NeXT and Be technology compare to Apple’s Mac, and why did both have trouble selling a new platform? Stay tuned for the next installment.